Are you in need of professional tree care services, like cabling, trimming, or pruning? Searching for experienced professionals who can remove a tree, take down a dangling limb, or grind a stump? 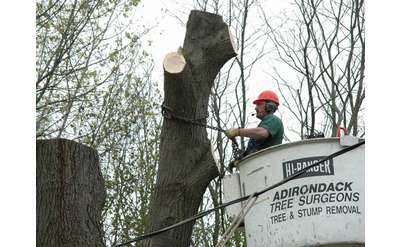 The tree care experts listed below service the Clifton Park area with an array of tree-related offerings. Many are even available 24 hours a day in case of emergency situations. Earth Care has a trio of certified arborists who will give you an informative evaluation of any questionable trees. Initial estimates are free of charge. Services include tree removal, pruning, stump grinding, cabling, lot clearing, and more. For over 30 years, Tom Mullan Tree & Stump Removal has been offering quality tree care services in Saratoga County, including tree removal, trimming, storm damage, lot clearing, stump grinding, and more. Foothills Tree Service offers tree removal, pruning, cabling, and bracing services, as well as lot clearing, property assessments, and more to those in Saratoga, Albany, Schenectady, Washington, Warren, and Fulton Counties. High Peaks Tree Removal offers a variety of tree-related services - including 24 hour emergency service - to clients in Warren, Washington, Saratoga, Essex, and Schenectady Counties. Offerings include tree removal, stump grinding & chipping. Call Richard Sears Tree Experts for all your tree removal, storm damage, and stump grinding needs. 24 hour emergency service is available, and the company offers free estimates to those within a 100 mile radius of Glens Falls.